The Society's emblem, chosen in 1973, on the 50th anniversary of the Society, is the King Stag Beetle, Phalacrognathus muelleri (Macleay), Family Lucanidae (Coleoptera). 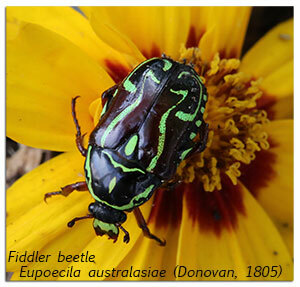 Its magnificent purple and green colouration makes it one of the most attractive beetle species in Australia. It is restricted to the rainforests of northern Queensland. to the website of the Entomological Society of Queensland. The Society promotes liaison among entomologists through regular meetings, distributes a News Bulletin to members, provides collection permits and publishes the Australian Entomologist. Membership renewals for 2019 are due January 1st. Renewal forms are available here. (Or quick links on the bottom of the page). Please let the secretary know if you have recently changed your postal or email contact details. The Australian Entomologist is a non-profit journal published in four parts annually by the Entomological Society of Queensland and is devoted to entomology of the Australian Region, including New Zealand, Papua New Guinea and islands of the south-western Pacific. Papers since Volume 1 (1974) are currently available online from Informit.